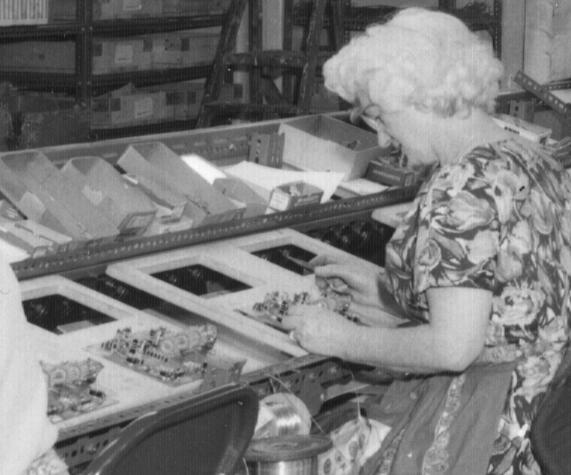 The assembly line system was based on placing items onto felt covered boards. These boards could then be kept in racks for storage. 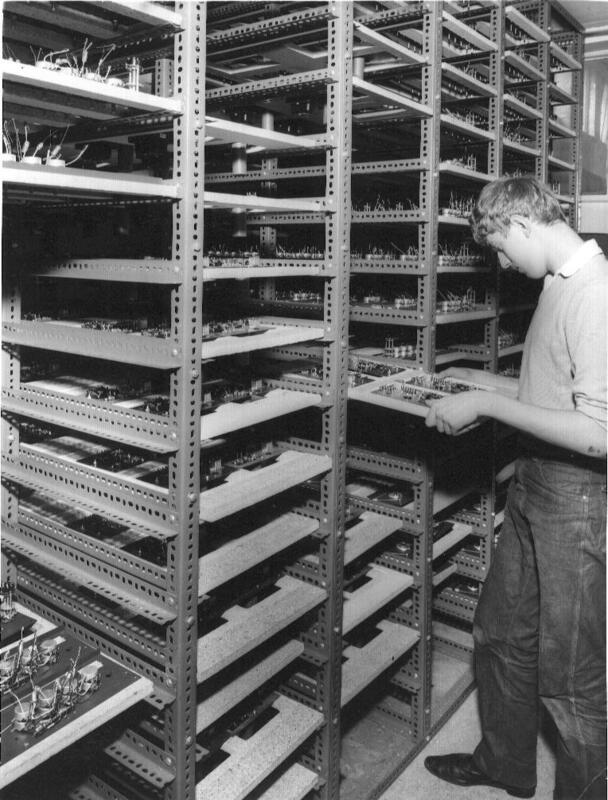 The above picture shows various partly-assembled chassis parts racked on boards for temporary storage during production. The boards could be used to hold chassis, circuit boards, or completed sets for adjustment and testing. 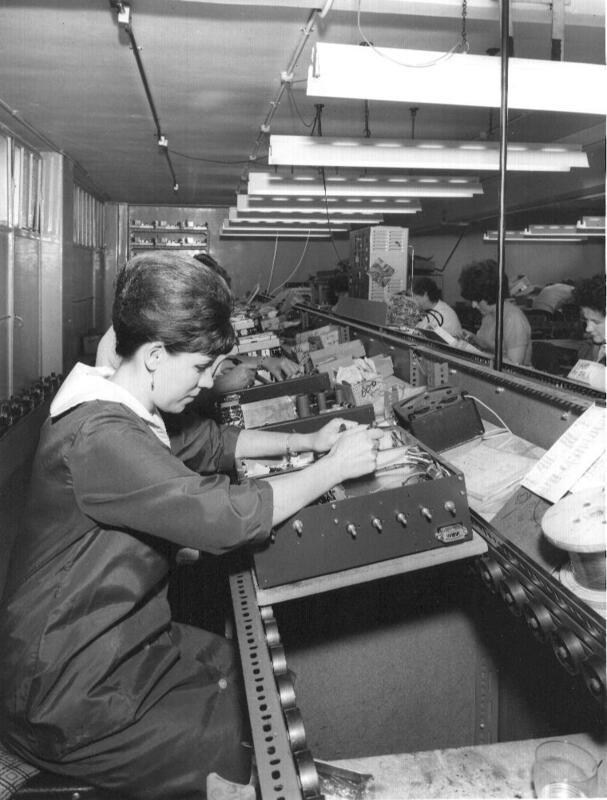 The above picture is a general view of the production line looking down from the open end of the ‘U’-shaped line. This photo, and the other black and white images on this page were all taken sometime in the early 1960's. The image shows a small section of the above photo in more detail. This makes it easier to see how production line boards were cut out to have wells that could hold a circuit board or chassis section while leaving the undersides of components and leads free. 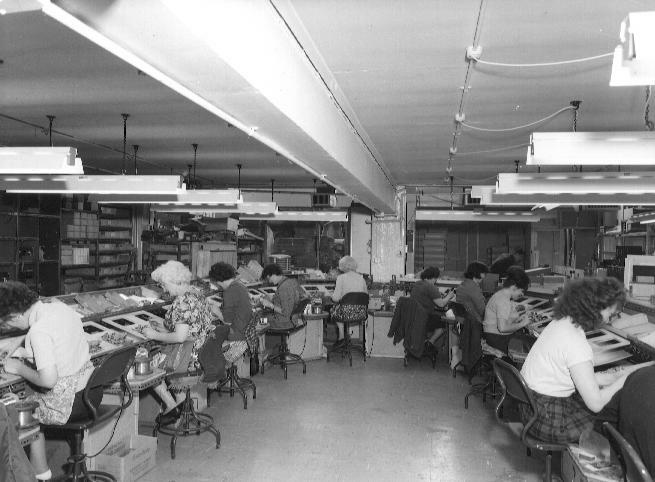 The actual production line was a track with a series of rollers or wheels along which the boards could be slid from one worker to the next. This made moving sets along the line quite easy. The system also introduced some flexibility into the work. The rollers can be seen more clearly in the image below. This shows a full chassis having components fixed and wired into place. Someone who wanted a break could ensure that they had completed one or two items and shoved them along towards the next worker in line. A small backlog might accumulate at their workstation during their break. However they could then catch up when they resumed work. The system allowed people to work and take breaks as they chose provided the work got done. This was a much more comfortable way to operate than being tied to a mechanically moving line. It also made it easier for the amount of construction work per person to be varied. This meant that swift and capable workers could build a greater fraction of a set, and earn more money, if they chose.